Elizabeth Afoley Quaye, Minister of Fisheries and Aquaculture Development in partnership with the Greater Accra Regional Security Council (GARSEC), has inaugurated a five member Premix Fuel Monitoring Team for the region. The members of the team are Ishmael Ashitey, Greater Accra Regional Minister(Chairman), Abu Rhamani, Emmanuel Clottey, Joseph Acheampong Peprah and Seth Nii Don Meeyeoya. 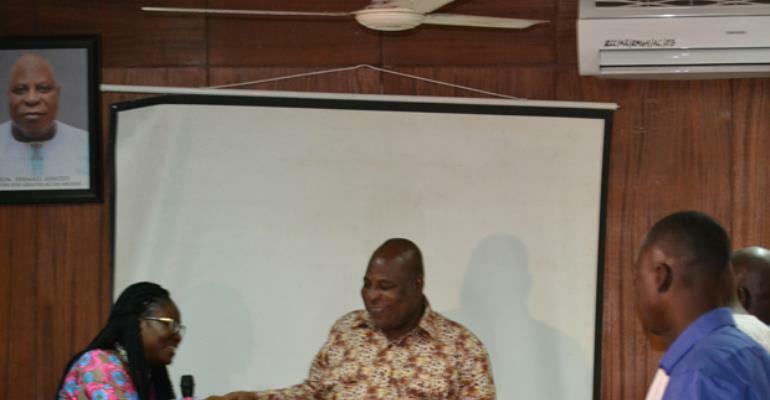 Presenting the mandate to the Monitoring Team at the Greater Accra Regional Coordinating Council on Monday, Afoley Quaye stated among other things that the monitoring team is expected to liaise between the various Landing Beaches Committees (LBC) and the National Premix Fuel Secretariat (NPFS). The Monitoring Team is to estimate premix fuel consumption for LBCs which, according to her, will be the basis for future allocations, monitor and reconcile premix fuel dispatch from Tema Oil Refinery (TOR) to ensure safe delivery at the final destination. She further indicated that the team is to ensure LBCs compliance with sales and safety measures in line with the National Premix Fuel Committee Regulations (L.I 2233) and National Petroleum guidelines. It is to prepare also and submit monthly and annual reports on its operations and ensure that complaints and concerns of fisher folks at the various landing beaches are reported to the NPFS promptly. Madam Afoley Quaye who lauded the Tema Marine Police for their efforts at making a number of arrests recently, expressed hope that the Monitoring Team will work even harder. Mr. Ishmael Ashitey, Greater Accra Regional Minister speaking on behalf of the Monitoring Team assured that they will do their best to ensure that diversion of premix fuel becomes a thing of the past. “It is a known fact that government, in his keen interest to promote fishing and aquaculture, is heavily subsidizing the price of the premix, we cannot just watch this huge investments go waste” he stressed. The Ministry of Fisheries and Aquaculture in recent times has suffered public outburst following a number of allegations, which according to the Minister, has resulted in the introduction of a number of reforms including ongoing auditing of landing beaches nationwide.